Built-in Radar Sensor: More sensitive and wider sensing range than traditional PIR motion sensor led light bulb, auto radar motion detection for light on/off. Infrared sensor with a 120-degree detection angle and 16-26ft detection range. Attention: Not only human, cars and animal will make this bulb works also. Easy to install: Simply screw into any standard E26/27 light socket or fixture, no wires or additional motion detection fixtures required. 50 Watt Equivalent ,2700K Warm White. This bulb will provide a bright and warm light for you. Energy Saving: It would turn on within less than 15Lux light intensity. It lasts for 30 seconds when the movement ceases. 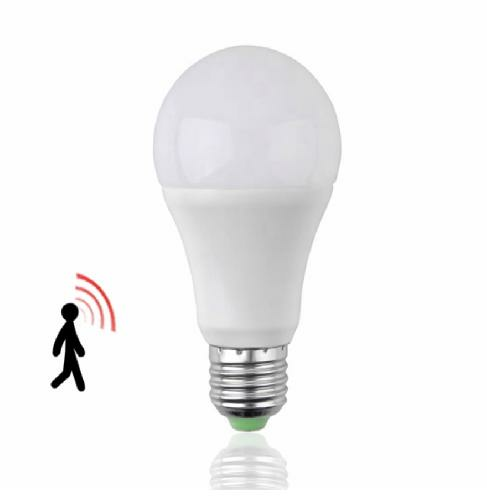 Long Lifespan: The sensor model of this smart bulb is new design that after first installed, the light motion sensor will enters normal model: turns on in the dark and dusk when motion is detected. This design increases the lifespan which is more than traditional motion sensor light bulb. Widely Application: The radar motion senor bulb suitable for indoor, outdoor, household corridor, hallway, passage, garage, stair, step, toilets, office, coffee house, shopping center, exhibition hall, hospital etc.